Hiring? Toptal handpicks top WordPress engineers to suit your needs. We are only human, and one of the traits of being a human is that we make mistakes. On the other hand, we are also self-correcting, meaning we tend to learn from our mistakes and hopefully are thereby able to avoid making the same ones twice. A lot of the mistakes I have made in the WordPress realm originate from trying to save time when implementing solutions. However, these would typically rear their heads down the road when issues would crop up as a result of this approach. Making mistakes is inevitable. However, learning from other people’s oversights (and your own of course!) is a road you should proactively take. Engineers look like superheroes, but we’re still human. Learn from us. Why should I use debugging when my code is working fine? Debugging is a feature built into WordPress that will cause all PHP errors, warnings, and notices (about deprecated functions, etc.) to be displayed. When debugging is turned off, there may be important warnings or notices being generated that we never see, but which might cause issues later if we don’t deal with them in time. We want our code to play nicely with all the other elements of our site. So, when adding any new custom code to WordPress, you should always do your development work with debugging turned on (but make sure to turn it off before deploying the site to production!). This is not an exhaustive list of configuration options that can be used, but this suggested setup should be sufficient for most debugging needs. What is wrong with adding the scripts into my header template? WordPress already includes a plethora of popular scripts. Still, many developers will add additional scripts using the wp_head hook. This can result in the same script, but a different version, being loaded multiple times. Enqueuing here comes to the rescue, which is the WordPress friendly way of adding scripts and styles to our website. We use enqueuing to prevent plugin conflicts and handle any dependencies a script might have. This is achieved by using the inbuilt functions wp_enqueue_script or wp_enqueue_style to enqueue scripts and styles respectively. The main difference between the two functions is that with wp_enqueue_script we have an additional parameter that allows us to move the script into the footer of the page. If the script is not required to render content above the fold, we can safely move it to the footer to make sure the content above the fold loads quickly. It’s good practice to register the script first before enqueuing it, as this allows others to deregister your script via the handle in their own plugins, without modifying the core code of your plugin. In addition to this, if the handle of a registered script is listed in the array of dependencies of another script that has been enqueued, that script will automatically be loaded prior to loading that highlighted enqueued script. Always create a child theme if you plan on modifying a theme. Some developers will make changes to the parent theme files only to discover after an upgrade to the theme that their changes have been overwritten and lost forever. The above example creates a child theme based on the default WordPress theme, Twenty Sixteen. The most important line of this code is the one containing the word “Template” which must match the directory name of the parent theme you are cloning the child from. The same principles apply to WordPress core files: Don’t take the easy route by modifying the core files. Put in that extra bit of effort by employing WordPress pluggable functions and filters to prevent your changes from being overwritten after a WordPress upgrade. Pluggable functions let you override some core functions, but this method is slowly being phased out and replaced with filters. Filters achieve the same end result and are inserted at the end of WordPress functions to allow their output to be modified. A trick is always to wrap your functions with if ( !function_exists() ) when using pluggable functions since multiple plugins trying to override the same pluggable function without this wrapper will produce a fatal error. Notice how I am not using the value wp_users for the table name, but instead, I’m letting WordPress work it out. Using these properties for generating the table names will help ensure that we return the correct results. Why wouldn’t I want search engines to index my site? Indexing is good, right? Well, when building a website, you don’t want search engines to index your site until you have finished building it and have established a permalink structure. Furthermore, if you have a staging server where you test site upgrades, you don’t want search engines like Google indexing these duplicate pages. When there are multiple pieces of indistinguishable content, it is difficult for search engines to decide which version is more relevant to a search query. Search engines will in such cases penalize sites with duplicate content, and your site will suffer in search rankings as a result of this. 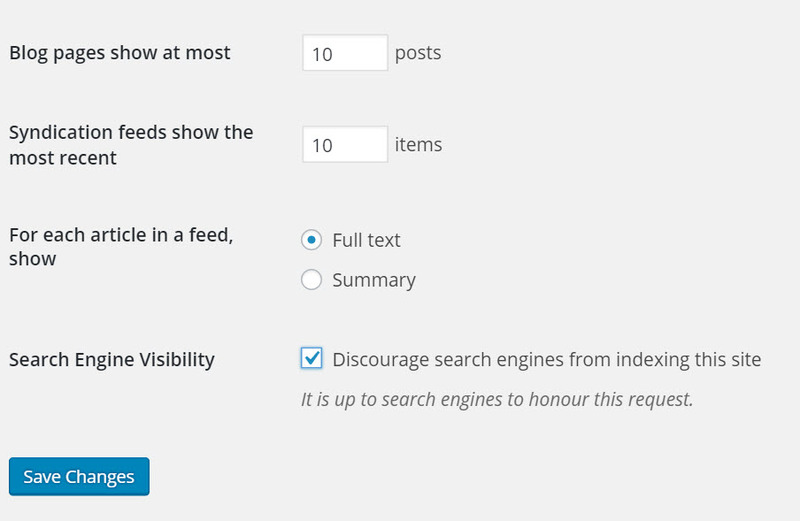 As shown below, WordPress Reading Settings has a checkbox that reads “Discourage search engines from indexing this site”, although this does have an important-to-note underneath stating that “It is up to search engines to honor this request”. Authors are less likely to change the name of a plugin’s class, so I would generally recommend using this method. Scripts can be removed with the function wp_dequeue_script($handle) via the handle with which they were registered. Similarly, wp_dequeue_style($handle) will prevent stylesheets from being loaded. However, if this is too challenging for you to implement, you can install the Plugin Organizer that provides the ability to load plugins selectively based on certain criteria, such as a post type or page name. It’s a good idea to disable any caching plugins, like W3Cache, that you may have switched on to stop you from having to refresh the cache constantly to reflect any changes you have made. The above code, when copied into your theme’s functions.php file will only display the Admin Bar for administrators of the site. You can add any of the WordPress user roles or capabilities into the current_user_can($capability) function to exclude users from seeing the admin bar. This filter hook is applied to the translated text by the internationalization functions __() and _e(), as long as the textdomain is set via the aforementioned functions. Search your plugins for these internationalization functions to see what other strings you can customize. By default, WordPress uses a query string with the post’s ID to return the specified content. However, this is not user-friendly and users may remove pertinent parts of the URL when copying it. More importantly, these default permalinks do not use a search engine friendly structure. Enabling what we call “pretty” permalinks will ensure our URLs contain relevant keywords from the post title to improve performance in search engine rankings. It can be quite a daunting task having to retrospectively modify your permalinks, especially if your site has been running for a significant period of time, and you’ve got hundreds of posts already indexed by search engines. So after you’ve installed WordPress, ensure you promptly change your permalinks structure to something a little more search engine friendly than just a post ID. I generally use the post name for the majority of sites I build, but you can customize the permalink to whatever format you like using the available permalink structure tags. This article is by no means an exhaustive list of mistakes made by WordPress developers. If there’s one thing you should take away from this article, though, it’s that you should never take shortcuts (and that’s true in any development platform, not just in WordPress!). Time saved now by poor programming practices will come back to haunt you later. Feel free to share with us some mistakes that you have made in the past—and more importantly any lessons learned—by leaving a comment below. "WordPress is easily the most powerful open source blogging and content management system available online today" is what is known as a "dis/qualifying" statement. It disqualifies everything that comes after it as just as invalid. It is a "stop if they really said what they just said, they really don't know the problem domain as well as they think they do and most everything else will be just as wrong". I don't understand what you said. What is your alternative solution? Used properly WordPress is a very powerful, easily customisable CMS that enables many non-tech savvy users to publish content and run their own websites. In my opinion, there is nothing else that competes with it in terms of its popularity and use. It depends on what you use wordpress for. I used WordPress for the end users, and a custom Laravel application for the database back end. That way I get the best of both worlds. Users can easily write new content using posts and pages, and they can use a shortcode to remotely get data using a REST API, all invisible for the end user. They do not need to learn working with a new platform, and I have the luxury of using templates, designs and plugins. Mistake #1 "Using Wordpress in the first place" Mistake #2 "see also #1" Mistake #3 "see also #1" Mistake #4 "see also #1" Mistake #5 "see also #1" Mistake #6 "see also #1" Mistake #7 "see also #1" Mistake #8 "see also #1" Mistake #9 "see also #1"
There's no such thing as "WordPress Developers"
let me spell it out. The claim that "WordPress is easily the most powerful open source blogging and content management system available online today" is so ludricis and false that it colors everything else that the person that is making that comment is going to say afterwards and unreliable at best and just flat out incorrect at worst. I think that the biggest mistake is calling someone "Wordpress developer" and using Wordpress in the first place. I am developing sites on top of Wordpress during the past 2 years, and I develop some projects using Laravel. What I ended up with this rule: use Wordpress for small and medium sites, use Laravel for Larger projects, specially those that will have mobile app. Bolt cms, Process wire, October cms. In my opinion, one of the most common mistakes that many novice web designers tend to stick is the overuse of the default theme, which gives them a pretty basic looking website. Mistake #0 "Developing in WordPress Remotely" There is absolutely no need to turn on debugging on a production site, or on the server where the production site will eventually be. Develop locally, and turn on all your debugging there. That way you don't have to tell web crawler to not index your site, and not turning on debugging. Mistake #11: Not caching your website. WordPress does 10 - 15 trips to the database to render a list of posts. Cache that stuff if the content isn't updated that often. Mistake #12: Not using PHP 7 It's a proven fact that WordPress runs twice as fast in PHP 7. Update your server, and see an increase in performance right away. Mistake #13: Not using WP-CLI Any developer who works with WordPress and isn't familiar with WP-CLI is making a disservice to himself. It's an amazing tool, learn it and use it. I agree 1 million times! I think WordPress is broken and outdated. You absolutely find out the correct mistakes in wordpress thanku its really helpful for me to improve my wordpress skill. Andrew is an Australian engineer with a passion for travel. He's a highly capable professional specializing in WordPress with the ability to offer extensive technical expertise coupled with outstanding communication skills. His strengths include an ability to rapidly become familiar with new business processes and systems. He has over a decade of experience working as an app developer across the full project lifecycle.